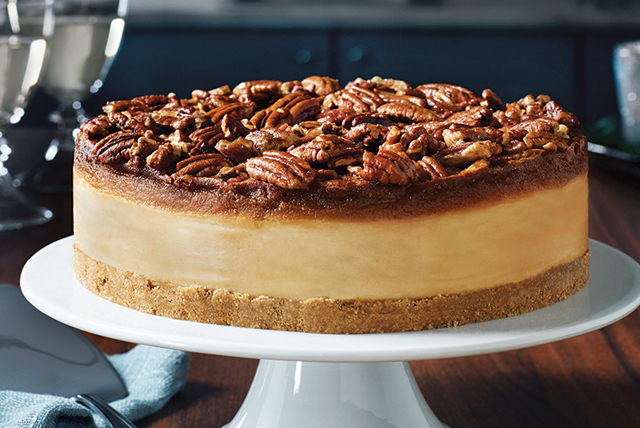 For a twist on the classic pecan pie we decided to combine it with our other favourite desert…cheesecake! The velvety cream cheese centre gives this dessert a lovely tang that pairs well with the rich pecan and butterscotch topping. This mouthwatering recipe is sure to become a dinner party staple! Mix graham crumbs and 4 Tbsp. butter; press onto bottom of 9-inch springform pan. Beat cream cheese, 3/4 cup sugar and vanilla with mixer until blended. Add 3 eggs, 1 at a time, mixing on low speed after each; until just blended. Pour over crust. Bake 30 min. Meanwhile, mix remaining sugar and butter until blended. Beat in remaining eggs and corn syrup; stir in nuts. Remove cheesecake from oven; gently spoon nut mixture over cheesecake. Return to oven. Bake 40 min. or until nut mixture is set. Cool completely. Refrigerate at least 4 hours. Do not run knife around rim of pan to loosen cake until nut topping is cooled and set.